Josh Graham does not have any MLB stats for the season. Draft: 2015, Atlanta Braves, 4th rd. His uncle is former major leaguer, Jamie Burke. Split the season between High-A Florida and Double-A Mississippi, combining to go 3-4 with a 3.98 ERA (27 ER/61.0 IP) and three saves in 41 appearances...Allowed eight runs (six earned) over his first four appearances (6.1 IP, 8.53 ERA) before pitching to a 3.46 ERA over his final 37 outings...Opened the season with Florida before moving to Mississippi on 8/5...Lefties hit .200 (20-for-100) with two extra-base hits against him, including 2-for-19 (.105) at the Double-A level...Played for Peoria in the Arizona Fall League..Had a 6.97 ERA (8 ER/10.1 IP) over nine games. 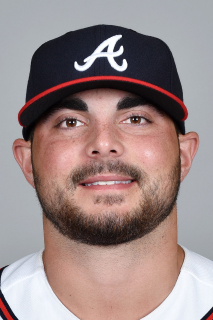 March 15, 2019 RHP Josh Graham assigned to Atlanta Braves. August 1, 2018 RHP Josh Graham assigned to Mississippi Braves from Florida Fire Frogs. May 29, 2018 RHP Josh Graham assigned to Florida Fire Frogs from Mississippi Braves. January 26, 2018 Atlanta Braves invited non-roster RHP Josh Graham to spring training. August 5, 2017 RHP Josh Graham assigned to Mississippi Braves from Florida Fire Frogs. April 25, 2017 RHP Josh Graham assigned to Florida Fire Frogs from Danville Braves. April 20, 2017 RHP Josh Graham assigned to Danville Braves from Florida Fire Frogs. April 4, 2017 RHP Josh Graham assigned to Florida Fire Frogs from Rome Braves. May 4, 2016 Rome Braves activated RHP Josh Graham from the 7-day disabled list. April 7, 2016 RHP Josh Graham assigned to Rome Braves from Danville Braves. June 22, 2015 Atlanta Braves signed RHP Joshua Graham. June 22, 2015 RHP Josh Graham assigned to Danville Braves.